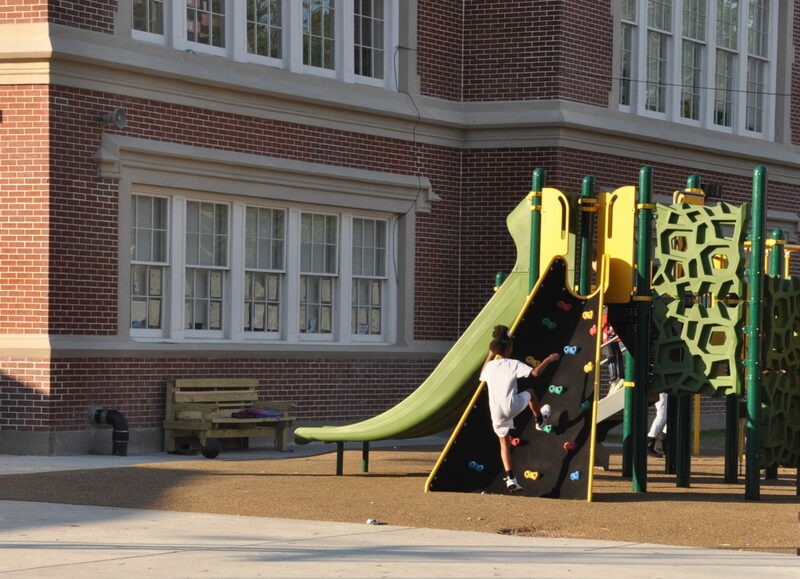 A child plays on Bricolage Academy’s playground after school on March 26, 2019. A Bricolage Academy parent delivered an impassioned plea for greater special education oversight and services to the charter school’s board of directors at their monthly meeting on Tuesday night. Roby Chavez, the father of two boys at the Mid-City charter school, said his two kindergarteners have autism and one also has attention-deficit/hyperactivity disorder, commonly known as ADHD. Both have Individual Education Plans, a contract between parents and a school that acts as an educational roadmap for school employees, required by federal law. He informed the board he had filed a formal special education complaint with the Louisiana Department of Education and the Orleans Parish School Board. He asked Bricolage’s board to form a committee to address special education concerns at the pre-kindergarten through fifth-grade school on Esplanade Avenue. “We take the responsibility for student well-being very seriously for all children at Bricolage,” Bricolage CEO Josh Densen wrote in an email to The Lens. After the meeting, Board President Alan Philipson said the board asked Densen to investigate. “We have told Josh that we want a full report back by April 15,” he said. Chavez also told board members he and other parents of students with disabilities have had concerns with Bricolage’s after-school program. His comments happened to follow a financial report by the board member Merritt Lane, who said the after-school program is running a deficit this year. Chavez alleged one parent was told she’d have to pay extra money for her son with a disability to attend so he could have extra support. Densen said it was a miscommunication. A senior attorney with the Southern Poverty Law Center said the law that protects students with disabilities extends to after-school and extracurricular activities. The Individuals with Disabilities Education Act requires schools to provide a free and appropriate education to all students. “The IDEA treats after-school programs as a function of the child’s education,” SPLC Senior Supervising Attorney Victor Jones told The Lens in an interview Wednesday. The requirements can present financial challenges for schools, something school leaders often note. Last year, the school district struggled to accommodate one student with profound special education needs. Students who have disabilities can cost more to educate because their needs may require additional interventions and services. Special education funding often doesn’t cover all of the costs. Funding for afterschool programs is already hard to secure. Bricolage’s program has three payment tiers. Students who receive free or reduced price lunch attend for free or a reduced price. Students who don’t qualify for that income based program pay full price to attend. Enrollment in the program overall is lower than was expected, board members said Tuesday. Chavez, who is the communications director for the Louisiana Association of Public Charter Schools, told the board he was speaking as a parent Tuesday. He said he and other parents were concerned about how a new after-school behavior policy could affect their kids’ ability to stay in the aftercare program. Violations come with first a one-day suspension, then a three-day suspension and the potential to be removed from the program. “It appears the school has decided behaviors by students with disabilities are punishable and it is a convenient way to exclude them,” Chavez said Tuesday. But Chavez and his husband have concerns. Chavez told board members his son may respond to situations with a fight-or-flight mentality. The new behavior policy states students must stay in area they are assigned to and are only allowed to leave with a staff member. Jones said a child’s education plan should be updated to allow them to participate in a program. The Lens asked whether Densen thought the new policy could be seen as targeting students with IEPs. The Lens’ shared Jones’ comments with about the school’s obligations under federal law, including that aftercare should be a part of the school day. “Our after school program is open to all students, something that we take pride in,” he wrote. “We cannot, however, devote the the same level of highly specialized professional resources during after care as we do during the school day. Densen added, “Whether or not a student has an IEP, every child in our day or after school program is properly cared for and nurtured. Densen provided two statements to The Lens, asking that they be run in full. The full statements are available here and here. Chavez said his five-year-old son’s responses can also include verbal outbursts and sometimes he can be physically aggressive. “Last week, we walked into the school and my child was being carried into an abandoned office while the teacher turned around and held the door shut,” he said. Chavez told board members he doesn’t think the school is filing the proper paperwork with the state when seclusion and restraint techniques are used. Parents are to be notified in writing within 24 hours of an incident. Schools are allowed to use seclusion and restraint with students but staff members must be trained and it is not supposed to be used as a form of discipline. The seclusion space must meet requirements outlined in state law, such as having an observation window. He also said staffing during the school day has been a problem. The board entered executive session after hearing Chavez spoke. Philipson, the board president, said he was calling Chavez to follow up. Chavez said he is pleased with the board’s call for a report. “The members of this charter board are some of the most committed community members we know. It’s why we decided to bring our concerns to them,” he said.